I just started my new book this last week. 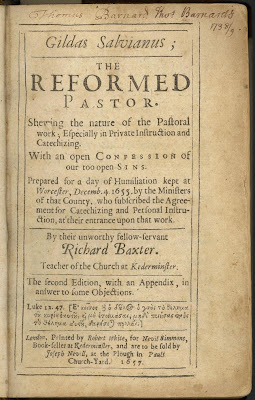 It is called The Reformed Pastor and it is by Richard Baxter. I purchased this book at a used book store while on a short vacation in Brown County. It sat on my shelf with a few other "to be read" books, slowly making its way to the top of the heap. So far I am really enjoying this book. It is mentally stimulating and spiritually challenging. I would offer a brief synopsis, but I thoroughly enjoyed Richard Baxter's own subtitling far more than anything that I could come up with. Here is an image I found on the ever-informative Wikipedia. Showing the nature of the Pastoral work; especially in Private Instruction and Catechizing. With an open Confession of our too open Sins. Prepared for a day of Humiliation kept at Worcester, December 4, 1655, by the Ministers of that County, who subscribed the Agreement for Catechizing and Personal Instruction, at their entrance upon that work. I just love that these ministers had prepared a day of Humiliation to confess their sins! I wonder how much the ministers of Danville (or your city) need to do this?! 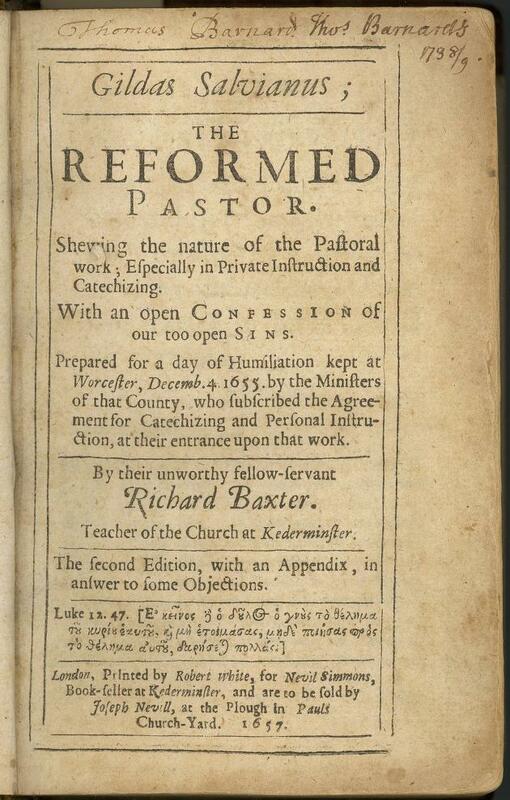 You can read more about Richard Baxter here. You can even read the whole book for free via Google Books, click here.